Mnaw. Look at the cute little...uh, wait what is that? Congratulations! 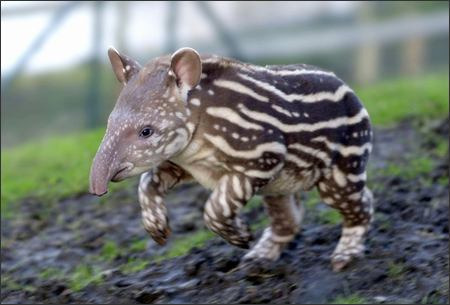 It’s a new baby Tapir! This animal is neither Pig nor Rhinoceros nor Elephant – but it is most certainly creepy. Tapirs resemble pigs with four toes and a truncated elephant nose. Their prehensile proboscis serves them well – they’re able to reach foliage otherwise unattainable. These herbivores can be found in the jungles of South/Central America and Southeast Asia though you may encounter some difficulty – all 4 species are currently endangered. Many thanks to dear reader Ming for suggesting such a fine addition to this menagerie of creepy. This site is amazing! Thanks! My boyfriend found it searching for “armadillo” on the web. ok i have officially found a web that i can honestly say i love!! i found it looking for german animals and first found a giant rabbit( i also commented on that as well ) and then was amazed ny the rest of these amazing creatures! omg thank you so much for making this site real!!! 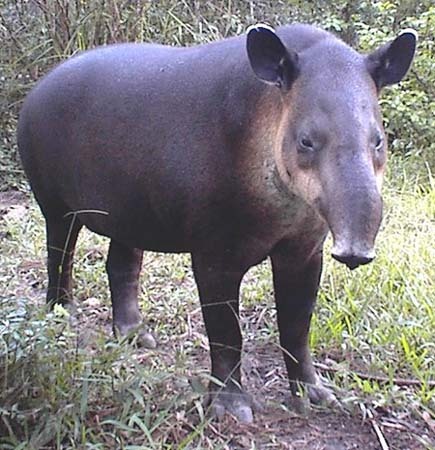 I dunno if it’s cause I’m brazilian, but I don’t think tapirs are creepy, haha!